The human face of climate change has tended to be obscured by technical and scientific issues. Much of climate change discussion has revolved around technicalities such as carbon emissions. For the most part the jargon used precludes understanding of the issue by those who are not scientists. This year in March saw a shift in that perspective, in the hope that beginning a conversation on the relationship between human beings and climate change would help humanize the face of climate change. Human rights became the paradigm through which the human dimension of climate change was explored. Perhaps an interesting starting point would be to ask why human rights? What makes them particularly suited to speaking about the interrelationship between climate change and human beings? Human rights most popularly defined as rights that are inherent to human beings. Their existence is contingent to humanity. As human beings we are entitled to a range of rights that have nothing to do with class, religion, and color. Human rights therefore are a consequence of shared humanity. 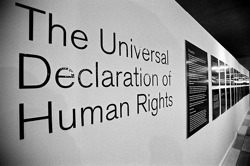 A range of universal rights have been afforded protection and status by their expression and inclusion in international law by way of treaties, conventions and customary practice. Using the framework of international human rights law as its reference point, the Office of the High Commissioner for Human Rights, United Nations commissioned a report on the relationship between human rights and climate change. It is interesting to note that the study was carried out pursuant to the United Nations Resolution tabled by the Maldives urging consideration of the challenges that climate change presents to protecting human rights. A range of rights are threatened by climate change such as the right to life, food, adequate housing and livelihood. The report speaks to each of these individually, placing them in the context of climate change and how it is eroding protection by compromising the ability of states to fulfill their obligations to their citizens. Despite the fact that many of these rights are standalone rights they are all intrinsically linked to the right to life, for what is the value of other rights when there is no life to live? A number of themes define the relationship between rights – interrelatedness, interdependence and indivisibility. Nowhere is it clearer than in the way climate change is continuing to challenge our very existence. The problem with being human is that we are only willing to act when we can clearly see the impact of our doing. This is especially true of collective and international action. Negotiations on climate change are essentially political. Oftentimes the short-term tenures of political office dictate how agendas are addressed. Climate change is not politically opportune, not least because it demands longer term sustainable measures and is dependent on persistent and continuous political will; something which is not always possible given the changes in government. Add to this the cost of developing global solutions; in the short run these costs are likely to be very high. Human rights can have the effect of summoning governments. Under the banner of international human rights obligations the call to address climate change can be strengthened. For instance the norm of international cooperation envisaged by the International Covenant on Economic, Social and Cultural Rights, the Charter of the United Nations and other developmental frameworks such as the Millennium Development Goals can be used to bear on governments to institute a global call of action and delivery. Developing states can use the covenants and their rights obligations as shields for their citizen’s rights, ensuring that assistance programs and development aid do not result in them violating their obligations. A rights-based approach to climate change will help secure sustainable courses of action even in policies used to address climate change. It is not enough to merely address climate change. It is important also to ensure that mitigation and adaptation actions under the United Nations Framework Convention on Climate Change do not promote degradation and hardship. A prime example was the production of bio-fuel that caused upward spikes in food prices compromising the right to food. And also recognize that this is a crucial time to act. The run up to Copenhagen demands action within the human rights community. It is essential that a strong rights voice be tabled at Copenhagen.